Get Fido packed up and ready to go with this lightweight, tough, custom-fit Baxter Pack. 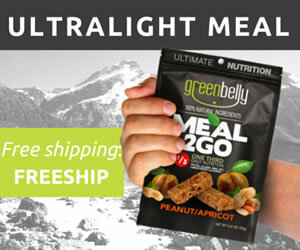 Great for everyday use or backpacking adventures. Built strong to withstand rugged outdoor conditions, it has 8 different adjustment points to get the proper fit for any dog. 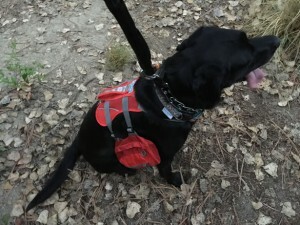 It includes a rear-mounted leash hook that works like a harness for pups that need to be on their lead. The ergonomic padded spine support contours to the dog’s back for a comfortable fit and provides weight distribution for the two saddlebags. The pack offers space to store all of your canine’s travel essentials such as food, treats, toys, first-aid supplies and travel bowls. Includes a large handle to help dogs over rock scrambles or extract them from water. Available in two sizes and comes in Barn Red, Coastal Blue, Sea Glass/Coral, or Black/Orange. 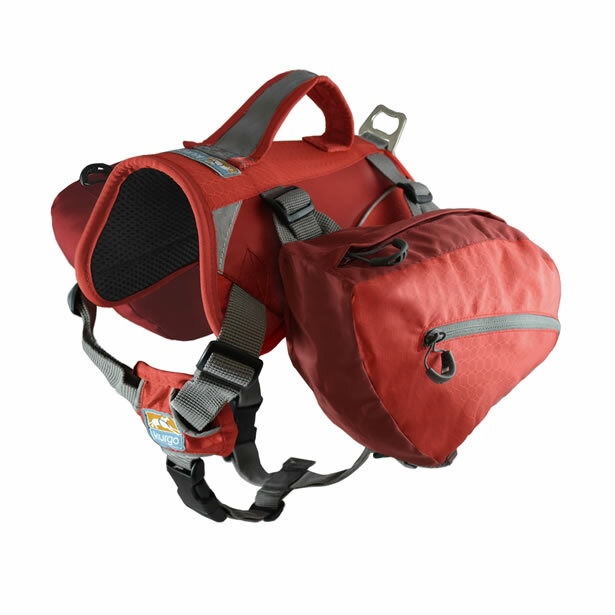 Kurgo’s Baxter Dog Backpack is designed to fit dogs 30-85 pounds with a combined volume of 3.75 liters. The Big Baxter is designed to fit dogs 50-110 pounds with a combined volume of 7.5 liters. Both sizes are available in the following colors: Coastal Blue, Barn Red, Sea Glass, and Black and Orange. The padded saddle provides the framework for the entire pack system. It is contoured and designed to comfortably fit the dog’s back along the spine while it supports and distributes the weight between the two saddlebags. The underside is covered with a black nylon mesh that allows air to pass between the padding and the animal for added comfort. The top of the saddle on the colored models is made from a rugged 300D polyester fabric with 400D polyester hexagon reflective safety panels inset along the center and on each side toward the rear of the saddle, while the top of the saddle on the black/orange model is made from a polyester Ripstop with TPE protective coating and orange 210D nylon Ripstop reflective safety panels inset along the center and on each side toward the front of the saddle. Along the center of the saddle, there is a large sturdy handle that provides extra control over the animal when you need it. Additionally, there is a sturdy rear-mounted steel buckle providing a solid attachment point for a leash allowing the pack system to double as a harness. The Baxter backpacks provide 9 adjustment points located strategically around the pack to provide a secure and comfortable fit when properly adjusted. The Baxter pack is for dogs from 30 to 85 pounds, and the Big Baxter is for dogs weighing between 50 and 110 pounds. The colored packs use a strap material that is a 1″ grey nylon webbing, while the black and orange pack straps utilize a black nylon webbing. The frontmost straps on the saddle run around the shoulders and down each side of the neck before attaching to a padded breastplate in the center where they can be adjusted. On each side of the saddle, there are two straps that are used to attach the saddle bags providing control over the height that the saddlebags will ride on each side of the animal relative to the saddle itself. Each saddlebag has two straps attached to the bottom of the bags used to connect the two saddlebags together with heavy-duty adjustable plastic buckles in between. 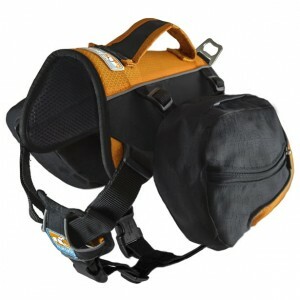 The frontmost strap also connects to the bottom of the padded breastplate with a heavy-duty adjustable plastic buckle. Like the saddle, the underside of the padded breastplates are covered with a black nylon mesh for breathability. The outer layer of breastplates on the colored models are covered with a rugged 300D polyester fabric and 400D polyester hexagon reflective safety fabric. The black/orange breastplates are covered with a polyester Ripstop with a TPE protective coating and a layer of orange 210D nylon Ripstop reflective safety fabric. The saddlebags on the colored models are made from a rugged 300D polyester fabric with the outermost panel made from an 400D polyester hexagon reflective safety fabric. The saddlebags on the black/orange model is made from a polyester Ripstop with TPE protective coating with a portion of the outermost panel made from an orange 210D nylon Ripstop reflective safety fabric. The Baxter pack has two pockets on each saddlebag with the largest pockets 7″ wide, 5″ tall, 3″ deep, and shaped like a parallelogram with the full zippered access along the top. The outer pocket is more of a thin sleeve with the zippered access across the middle of the pocket. Perfect for thin flat items. The Big Baxter pack also has two pockets on each saddlebag. The larger pocket is 9″ wide, 6″ tall, 3″ deep, and also shaped like a parallelogram with the full zippered access along the top as well. The outer pocket is a thin and flat with the zippered access across the middle of the pocket for thin flat items. I’ve got three retrievers nearly 80-pounds apiece, and each has a different body shape so I was a little concerned about how difficult fitting them might be. However, that thought was quickly alleviated. These backpacks are so easy to adjust, it only took a few minutes with each dog to fit them. At first, I wasn’t sure if they would like wearing them, but after they wore them for a little while I found that they actually like wearing them. 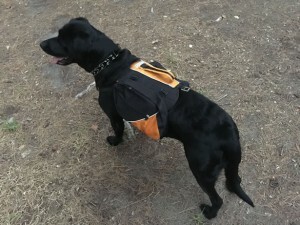 Once I had the packs on the dogs, I began experimenting with both pack sizes to see how much gear each could hold to determine which pack might work best as a lightweight EDC, and which would be best in a bug-out situation. I began by putting a few small kits together that I knew I would need and vacuum-sealed them individually to make them compact, waterproof and well-organized. In the first aid kit I packed some basic necessities like anti-bacterial ointment and wipes, tape, gauze and tweezers for pulling out those nasty thorns and such. In the fire-making kit I packed a lighter, waterproof matches, some quick-start tinder and a small ferro rod. In a basic repair kit I packed a mini-pocket knife, 5′ duct tape, and a spare AAA battery. Some of the loose items consisted of a small 80 lumen AAA flashlight, whistle, pack of jerky, collapsible nylon water bowl, ultralight pack towel, some plastic bags, mylar blanket, 20′ paracord, and a few individual packs of anti-bacterial wipes. Additionally, I added an 8-ounce water bottle in each side to balance out the weight out. The Baxter is the smaller of the two packs with a combined volume of nearly 3.75 liters so it was the obvious choice to try out first as an EDC for the dogs to carry when we’re out and about. But I found that fitting it all into the saddlebags was not easy an easy task. However, with some rearranging I was able to fit all the kits and the loose items while keeping it somewhat balanced. But there was no more room whatsoever. The Big Baxter is obviously the larger of the two packs with a combined volume of nearly 7.5 liters so I knew the EDC gear easily fit into the saddlebags with some room to spare, but not a lot… I found that I could fit two 16-ounce water bottles on each side rather than the 8-ounce bottle and easily squeeze a few more food items around them to boot. The smaller Baxter pack is certainly large enough to carry more than you would typically need when you’re on the go with your dog. But if you’re on a long trek then you might be needing a bit more storage, and the Big Baxter should fill that need. The Baxter and Big Baxter are lightweight and well-crafted, and tough enough to withstand the rugged outdoors. These packs are made from durable abrasion and water -resistant materials so the will be able to hold up when they come in contact with nasty underbrush and environmental conditions. All of the seams are well-sewn and the zippers feel durable enough to last keeping the gear secure inside the bags. 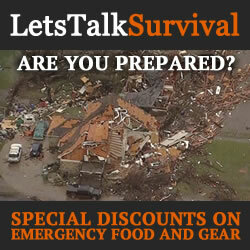 My EDC provides me with the piece of mind in knowing that I have some basic gear with me in the event of an emergency. I always have what I need to get by until help arrives or I can make my way home. 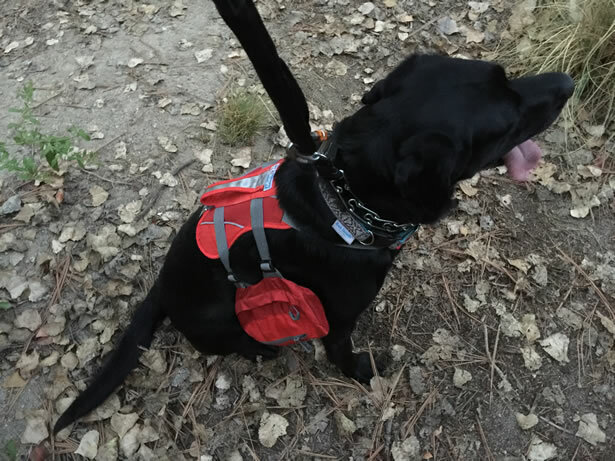 With my dogs sharing some of the load, I am able to lighten my own EDC a little when they are with me and I am still able to deal with the splinters, thorns, a sprain, or worse. 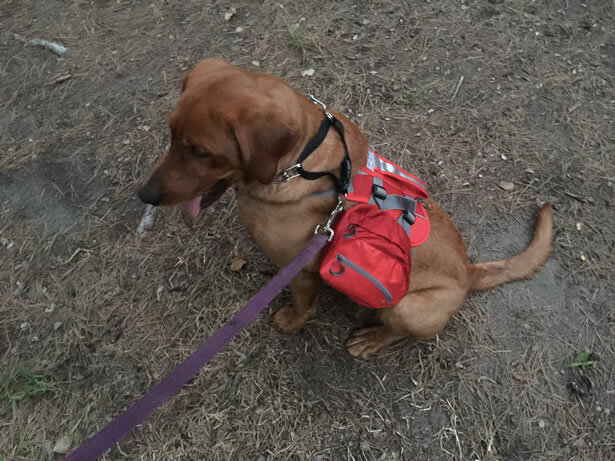 For right around $40 online, both of these packs are a phenomenal value as an EDC, or a bug-out bag for the longer hauls… And my dogs absolutely love wearing them. I think it makes them feel as though they are working. As a result, they seem more calm and focused on our walks. Kurgo is dedicated to helping people and their dogs get out and enjoy the world together. Their award-winning dog travel and outdoor products include everything from crash-tested car harnesses to car seat covers to outdoor products like dog backpacks and boots. And they all come backed up with a no hassle Lifetime Warranty when purchased from an authorized Kurgo dealer.